Photo by Watt Publishing. Published under Creative Commons license. This spring, avian flu has killed millions of turkeys and chickens in the Upper Midwest. 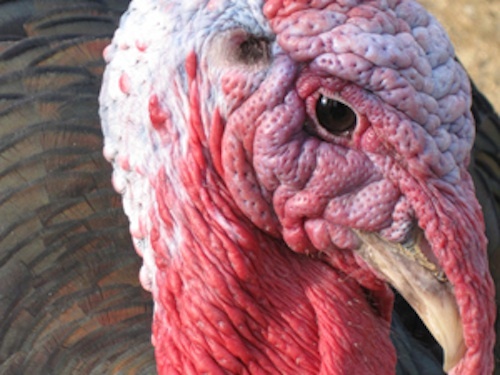 As the country’s turkey champion, Minnesota produces about 46 million turkeys per year. As of May 12, 85 Minnesota flocks in 21 counties have been hit by this bird flu. More than five million Minnesota birds have been affected. This avian flu outbreak has hit Minnesota particularly hard, with 85 of about 133 affected flocks in the state. The Minnesota flocks destroyed by avian flu are almost all large turkey operations, with tens or hundreds of thousands of birds. Two laying hen operations and one backyard flock of 150 birds have also been infected. The large turkey operations house birds in barns, as do the laying hen operations. They are raised in giant containment barns, never venturing out into open air. The official name for the virus is Highly Pathogenic Avian Influenza and the version now affecting the Upper Midwest is H5N2. Government officials think this strain of avian flu is spread by migrating wild birds, but they are not sure how the virus is getting into the turkey and chicken barns. Most farms have biosafety protocols for sanitizing equipment and worker clothing. Public health procedures go far beyond the affected farms. Officials test poultry on all the farms within about a six-mile radius of each infected flock. If any other birds are infected, the whole flock is killed. If a flock is healthy, then the state imposes a 60-day quarantine on poultry and eggs. Of course, if avian flu is found in another flock, that entire flock would also be killed. Some other strains of avian flu have affected humans in other places in the past, primarily those humans who work closely with infected poultry. The H5N1 strain has infected more than 700 people since 2003, and the H7N9 strain has infected more than 600 people since 2013, according to MPR. Several strains of the virus, including the one currently sweeping through Midwestern poultry flocks, have evolved from the original H5N1 bird flu virus. The current H5N2 virus appeared in 2014, from a combination of the H5N8 virus and other flu strains already present in the United States. Viruses continue to mutate as they spread, and the speed of their evolution is rapid. Other strains of the virus still exist. On May 11, the H5N8 virus was found in a backyard flock in Indiana. • Why does the disease hit turkeys and laying hens in large confinement operations, but not broilers or backyard flocks? One hypothesis is that the birds in containment operations are more susceptible to infection, both because they less opportunity to develop natural resistance and because viruses spread more rapidly in crowded conditions. That would account for the very low incidence of avian flu in backyard flocks, but it doesn’t explain why the disease has not hit any broiler operations in Minnesota. Minnesota’s broiler industry is huge, with more than 300 farms producing more than 47 million chickens annually. However, the flu has spread to at least one broiler operation in Iowa. According to the New York Times, broiler operations may have better biosecurity measures in place. • How does the virus spread from wild birds to birds in confinement barns? Wild birds seem less affected by avian flu. While they may be infected by the virus, they recover from it, unlike the large domestic flocks of turkeys and chickens, where infection spreads rapidly and is usually fatal. “Such breeding farms are traditionally known for having extremely tight biosecurity systems.” John Clifford, the US Department of Agriculture’s chief veterinary officer, recently speculated that the virus could be invading poultry confinements through wind carrying infected particles left by wild birds, taken onto the factory-farm floor by vents. • What can stop the outbreak of avian flu? Experts say that hot weather is likely to kill the virus — but that it can come back againin the fall, and may spread to the southeastern United States. • Is the avian flu a U.S. problem? While H5N2 is limited to the United States and Canada, various other strains of avian flu have been identified in Europe, Asia and the Middle East.